What’s better than having a giant billboard? A giant billboard that moves of course! With our city’s traffic problems, signwriting your company vehicle or fleet is a fantastic way to promote your business because we spend so much time in heavy traffic, and there’s nothing else to do than look at the other cars jammed on the motorway with you. One of the many signwriting services offered by Signwise is vehicle graphics for your corporate fleet. It’s is one of the best ways to ensure you’re getting the exposure you want for your business. There are many commercial benefits to vehicle sign writing or even completely wrapping your company vehicles, and with today’s technology and products, it’s worth noting that the vinyl and adhesives won’t damage the car’s paint, making it a great option for leased cars too. We can completely wrap your car, van or truck in your brand colours, giving an equivalent effect to repainting the vehicle. The cost of vehicle wrapping is similar to painting, but the main difference is, that when your lease expires and the vehicle goes back, there are no repainting costs. Yes, there is a small cost in stripping the wrap from the vehicle, but it’s nowhere near the cost of repainting it back to the original colour. Depending on your budget, we can provide graphics for your vehicle and contact details on the doors and rear, right through to a vehicle that is completely covered with a self-adhesive film or wrap. If you would like a complete car wrap, there are a variety of specialty films available such as matt colours, brushed stainless, carbon fibre and even mirror chrome at the extreme end. The other option is to use digital prints to sign write or wrap your vehicle. If you’re a florist for example, we can cover your entire delivery van with flowers. Imagine the impact that would have! Getting your name out there is an important step for any business, covering your cars in your brand colours, promoting your logo, website and phone number are great ways to tell people what you do and how they can contact you. Every business is fighting for a piece of the pie; there’s a lot going on for consumers with TV ads, digital banners, radio and social media advertising, so having your company logo on your cars, vans or trucks is a simple and effective alternative. One way to measure the return on investment (ROI) of vehicle wrapping, is to have a dedicated 0800 number that’s only promoted on your cars, so you can track who’s coming through to your business after seeing one of your sharp-looking company vehicles. At Signwise in Auckland, Wellington and Christchurch, our professional signwriters apply decals without damaging the car’s paint (and the same applies to removing them, meaning you can refresh your look when you need to). Vehicle wraps can actually protect cars from minor scratches and colour fading. It might seem like an onerous task but we take the hassle out of it, and the result is a moving billboard that promotes your business to the world. 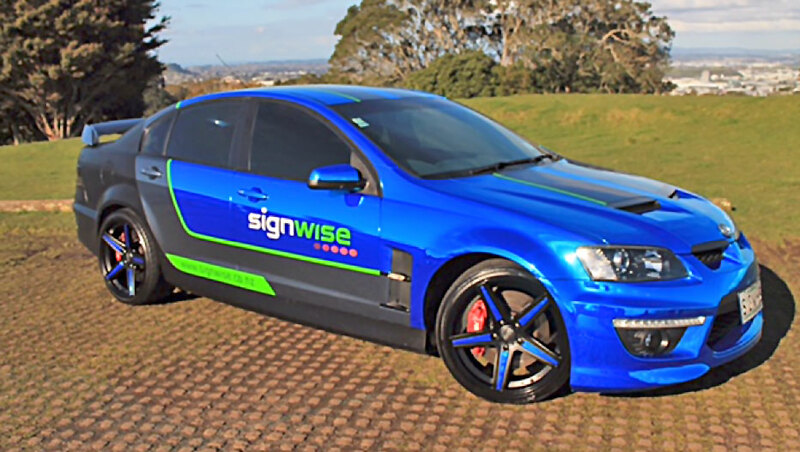 At Signwise, our vehicle signwriting designers will customise and tailor your vehicle graphics to meet your individual business needs. If you need to supply sales teams with vehicles to do their jobs, you might as well have your company logo on them and capitalise on the mobile advertising momentum. Our signwriters will ensure your business is well represented through the decals we design and apply it to your vehicle fleet. All car graphics designs are created and approved by our clients before vehicles are sign-written to ensure our clients are 100% confident and happy with the designs. During this process, changes and enhancements can be made and applied. For more information on vehicle graphics and wraps call 0800 SIGNWISE and we’ll be delighted to help you with all your signwriting needs.